Getting There: Grindelwald and Zermatt are in southern Switzerland. 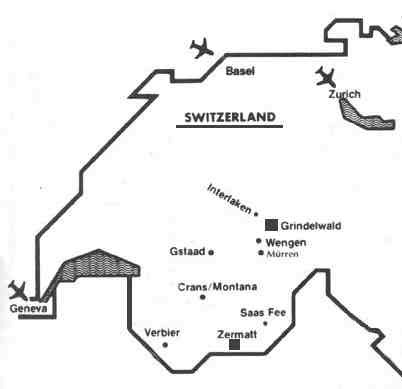 Gateway airports are located in Zurich and Geneva. Airlines that serve the two cities from the United States include Delta, Swissair, United, Northwest, KLM, Lufthansa, Scandanavian, British Airways and Air France. The 1-800 telephone numbers and Web links are listed on this magazine's Airlines page. For Grindelwald, trains from Geneva go to Interlaken and connect with regularly scheduled Bernese Oberland Railroad trains for the 35-minute ride to the village. A network of trains also connects Grindelwald with trains to the Jungfraujoch, Mannlichen and the Schlithorn. For Zermatt, trains from Geneva connect at Brig or Visp, where a mountain railway travels 90 minutes through the rugged Visp Valley. The Swiss Rail Web link offers schedules and fares. If you drive, we recommend you rent a car from the United States before traveling. Most major car rental agencies serve the Geneva aand Zurich airports. The 1-800 telephone numbers and Web links are listed in this magazine's Autos page. By car, Grindelwald is 2-1/2 hours from Geneva or 2 hours from Zurich. If driving to Zermatt, motorists can drive to Visp and as far as Tash, where trains or mini-bus taxis operate a shuttle service the remaining 4.8 kilometers to Zermatt, which prohibits motorized vehicles. Staying There: Grindelwald, with 3,850 residents, seasonally hosts up to 11,000 guests and has 4,000 to 6,000 daily visitors. The village has 52 hotels with 11,000-plus beds, 6,000 beds in holiday apartments (condominiums), 1,800 beds in boarding houses and hostels and four campgrounds. Contact the very helpful Tourism Office Grindelwald, CH-3818 Grindelwald, Switzerland; telephone 41-033- 854-12-12; fax 41-033541-12-10, email at touristcenter@grindel.htm, or click on the Web sites below for accommodations. 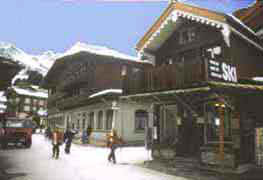 Zermatt hosts a wide range of accommodations at more than 100 hotels, apartments and chalets, including a youth hostel. Contact the Tourist Office, Bahnhofplatz, CH-3290, Zermatt, Switzerland; telephone 41-027-967-46-41; fax 41-027-967-01-85, email at zermatt@wallis.ch, or click on the Web sites below. Recommended guidebooks covering Switzerland are Lonely Planet Switzerland and Rick Steves' Germany, Austria and Switzerland (covers Jungfrau, but not Zermatt), available through this the Book Store. Swiss Federal Railways: Online timetable. 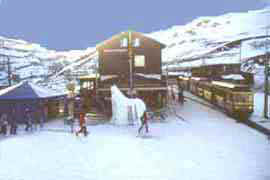 Zermatt Tourist Office: Information, accommodations, photos, reservations. 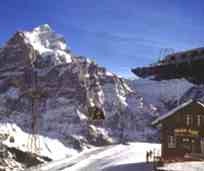 Grindelwald Tourist Office: Information on Jungfrau region, including accommodations, photos, reservations.